This article is about the musical group. For the Don Omar song, see Intocable (song). For the professional wrestler, see El Intocable. 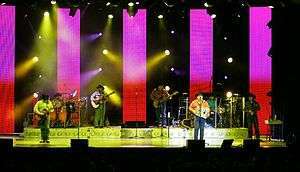 Intocable at the Chumash Casino Resort in Santa Ynez, California on July 13, 2006. Intocable (English: Untouchable) is a Norteño musical group from Zapata, Texas that was started by friends Ricky Javier Muñoz and René Orlando Martínez in the early 1990s. In a few years, Intocable rose to the top of the Tejano and Norteño fields with a musical signature that fused Tejano's robust conjunto and Norteño folk rhythms with a pop balladry. Intocable is perhaps the most influential group in Tejano and their tough Tejano/Norteño fusion has become the blueprint for dozens of Tex-Mex groups. The group's style, which combines romantic, hooky melodies, tight instrumentation and vocal harmony, is consistently imitated by other Tejano and Norteño groups, including Imán, Costumbre, Solido, Estruendo, Intenso, and Zinzero. They were the first of their genre to play at Dallas Cowboys Stadium, at the halftime show of the 2011 Dallas Cowboys vs. Washington Redskins game. They garnered two of the 5 nominations to the Billboard Regional Mexican Awards and got a nod for Best Norteño Album to the 2011 Latin Grammy for their album INTOCABLE 2011. They were also nominated for a Grammy for the album. INTOCABLE 2011 was released under the group’s own music label Good-i Music and the first two singles, Robarte Un Beso and Prometí, went to Number 1 on US regional radio charts. The 3rd single Arrepientete also did very well on radio and their 4th single Llueve was premiered live onstage at the 2012 Premio lo Nuestro where the group swept with all three categories they were nominated for. The group states that they are always looking out for that magical song with the right combination of lyrics and music that will intrigue and affect the life of everyday people. In 2010 the band was named, "group of the decade," and their style has influenced many bands in the U.S. and other countries. 1 2 Birchmeier, Jason. "Intocable - Biography". AllMusic.com. Retrieved 7 October 2013. ↑ "Intocable - Awards – Billboard Singles". AllMusic.com. Retrieved 7 October 2013. Wikimedia Commons has media related to Intocable.